The reviews for Donna Tartt’s Pulitzer Prize winner The Goldfinch seem to go one of two ways. Readers are either absolutely in love or vehemently despise it. I personally have given it a four-star rating on Goodreads because I haven’t been this emotionally attached to a book in a long time. It may be worth mentioning, however, that I experienced the novel as an audiobook, which provides a very different experience from that of the hardcover version. Like most longer pieces of fiction, it’s difficult to sum up the plot of this story because there are so many different threads. Thirteen year-old Theo Decker miraculously survives a New York museum bombing that results in his mother’s death. Before running to safety, he takes Carel Fabritius’ 1654 painting The Goldfinch from the wall. For the next 700 or so pages (30 hours for me), readers follow Theo and the painting on a journey that spans fifteen years and a lot of lies, drug use, and heartache. The length of The Goldfinch is probably one of its biggest criticisms. The problem with a book this large is that the few people daring enough to undertake such a task eventually lose interest in slow-moving plots. I did find myself questioning more than once Tartt’s emphasis on Boris and Theo’s illicit habits and their repetitive drunken blackouts. I agree that many of the scenes could have been reduced by half. But Theo’s philosophical insights and Tartt’s poetic and mesmerizing sentences did wonders for the pacing of the story. I personally love long books in general because I am allowed to grow up with the characters, and I found myself growing very attached to Theo. He did nothing in the book to really earn this endearment, of course, considering what a pathological liar he is. But there is something captivating about him that I really can’t put into words. I felt empathy and became excited when I found common bonds, even though I should hate him. The book ended and I found myself at a loss. I wanted more, wanted to see how the rest of his life was going to play out. While this only applies to the audiobook version, it’s worth mentioning that David Pittu is probably one of the best audiobook readers I’ve ever come across. He gives each character in The Goldfinch a distinct voice, which makes every conversation more animated. Boris’ accent would not have felt quite as real to me if I had to attempt it in my head, and I definitely wouldn’t have been able to make the sentences in Russian sound realistic whatsoever. I would still love to read the hardcover version when I have time to spare, since lack of free time was the reason I went with the audiobook in the first place. 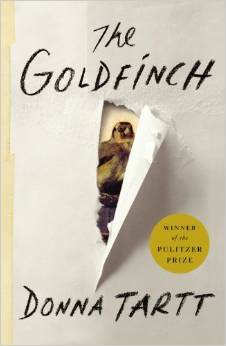 I encourage everyone to read The Goldfinch. I haven’t talk so much about a book in a long time. Any book that takes me on an emotional roller coaster like Tartt’s did deserves a chance, even if most of the reviews aren’t stacked in her favor. As for me, I’ve added Tartt’s earlier works to my “To-Read” list, in the hopes that they will touch and inspire me as much as The Goldfinch has.